So, I’d originally meant to post about how meds and drinking were going, but got distracted over…uh…a couple of months. 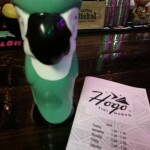 Well, in the meantime Hogo reopened! 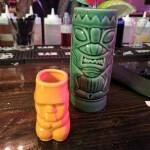 Tom Brown’s tiki nuevo bar, formerly further down 7th St two doors down from the old Passenger, reopened in the upstairs of the new Passenger at 1539 7th St NW tonight. Like the original, it’ll be open Tuesday through Saturday 5 PM until close (2 AM-ish). 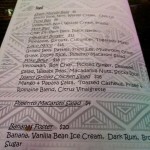 There’s a full menu of tiki related food stuffs and a number of drinks, including four tiki drinks on tap. I got to try the pork bun, which I enjoyed quite a bit, and the pimento macaroni salad which rocked my world. 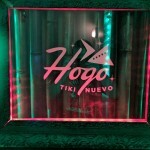 I also had a couple of tiki drinks (my limit these days with the old blood sugar plus fun with citric acid), the first thanks to Left Door’s Mick Perrigo (who is there this week only) who helped with the menu. It’s a smaller place than their old one – at least, it feels smaller – but very cool, if you’ve been upstairs before. I can’t wait to work my way through more of both menus.